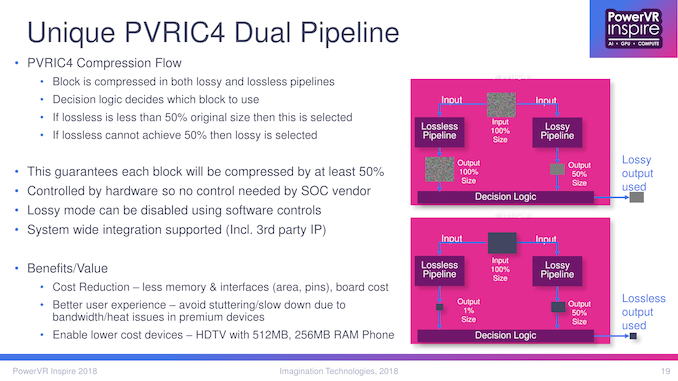 When Imagination first announced their PowerVR Furian architecture, it was only a month before they announced Apple was to phase out their use of Imagination's GPU IP. The state of matters was one where Imagination would end up selling off their MIPS CPU and Ensigma communications businesses, doubling down on GPUs, and finally being acquired by Canyon Bridge after putting itself up for sale. Investment into AI and automotive aside, the fact of the matter is that Imagination’s PowerVR GPUs are not just the company's workhorse, but are also critical in fueling their efforts into said AI and automotive. And in addition, the forward-looking Furian architecture was intended for high-end first and co-existing with Rogue for some time, making it crucial that Furian keeps progressing. 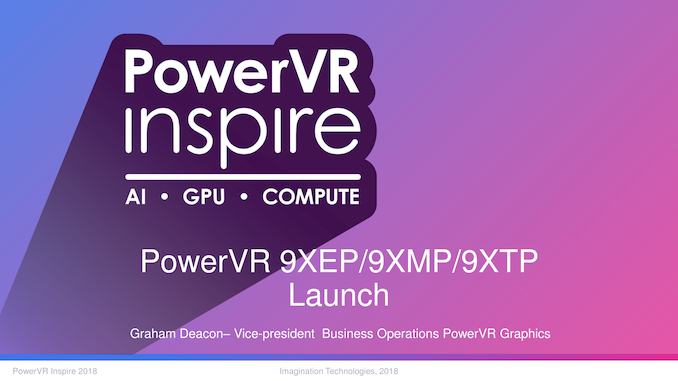 So today at PowerVR Inspire 2018 – actually the inaugural event – Imagination is announcing a new PowerVR GPU IP lineup: the Series9XTP, Series9XMP, and Series9XEP families. 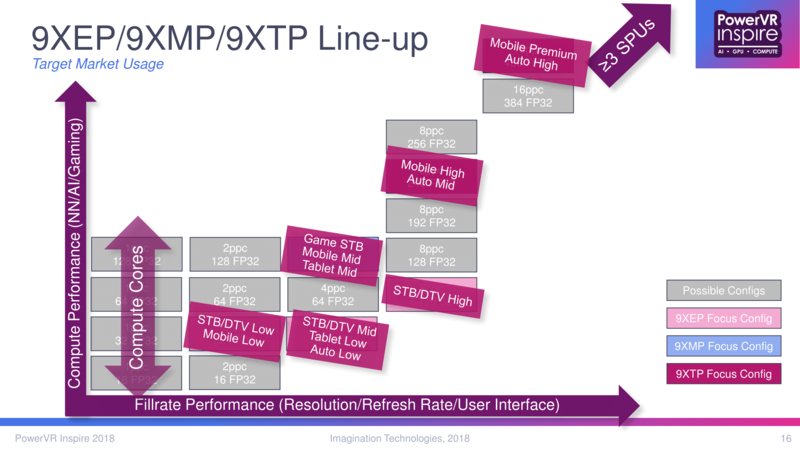 Succeeding the low-to-mid-range Series9XE and Series9XM cores launched last year, the new Series9XEP and Series9XMP offerings are similarly oriented towards the lower-end and mid-range, respectively. Unsurprisingly, the 9XEP is targeted for responsive set-top box/digital TV GUIs and entry-level mobile gaming, whereas the 9XMP is clearly focused on compute and gaming, looking towards the mid-range mobile space. 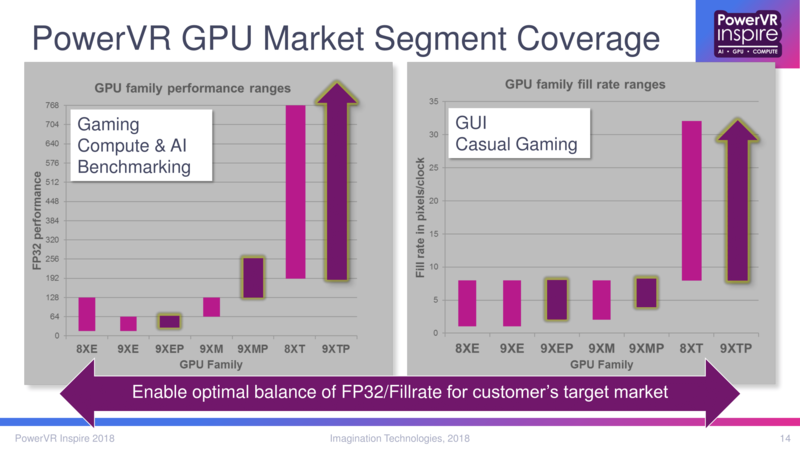 As opposed to the 9XE and 9XM, the differentiation between the 9XEP and 9XMP is clear when looking at how Imagination lays out their GPU IPs in terms of compute/gaming/processing power on the one side, and fillrate for higher resolutions and refresh rates on the other side. In that sense, there were a few trends responsible. One was the fact that premium gaming set-top boxes (STB) and digital TVs (DTV) never caught on, while simpler devices with more responsive and higher quality UIs were favored instead. The recent popularity of the mobile game variants of Fortnite and PUBG also underlined the potential demand for higher-end gaming capabilities even at more mid-range handsets. And with AI/NN functionalities also being pushed in the mobile space, the mid-range segment was too cost-sensitive for dedicated AI blocks. So with the Series9X-P, the 9XMP has a clear and specific niche in mind, though as with all of these IP cores, is easily configurable. Meanwhile, the high-end Furian-based 9XT remains geared towards premium mobile. Automotive is also a target use-case, though for the latter Imagination has also refocused on that segment with the specialized Series 8XT-A and their automotive initiative. On iterating on these implementations of Rogue and Furian, both general and specific microarchitectural tunings were made with these targeted segments in mind. For both Rogue-based cores, Imagination cites a dedicated texture cache enhancement and a larger system level cache. 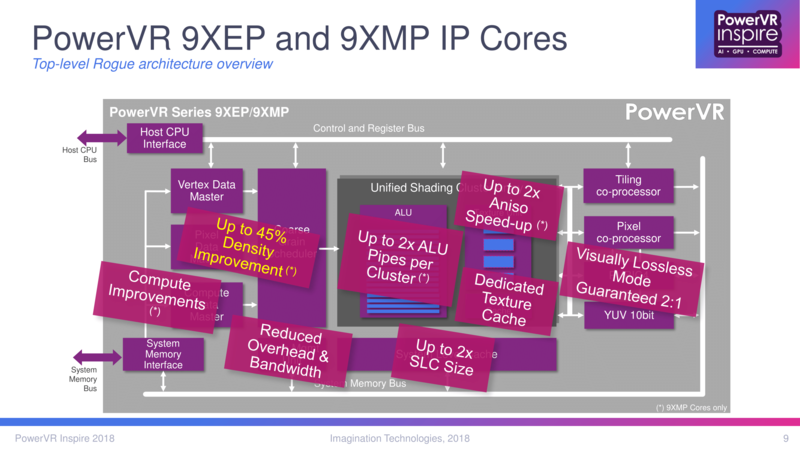 The lower-end 9XEP features timing improvements to enable higher core clocks over the 9XE. 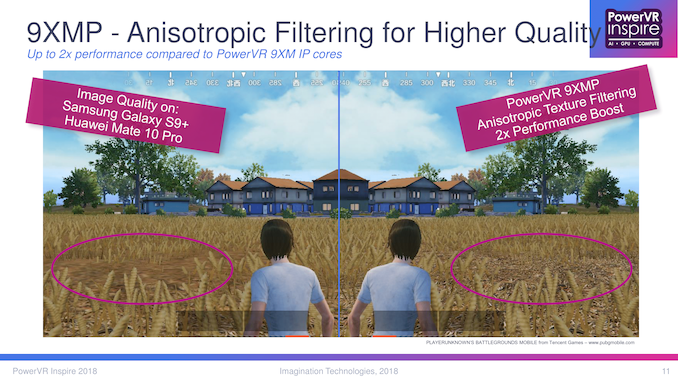 With the 9XMP, the block has improvements to gaming feature sets, including anisotropic texture filtering and shadow sampling speedups. For compute, ALU pipes can now be doubled per cluster, allowing for denser 32-wide single cluster ALU/TPU configurations over dual clusters. 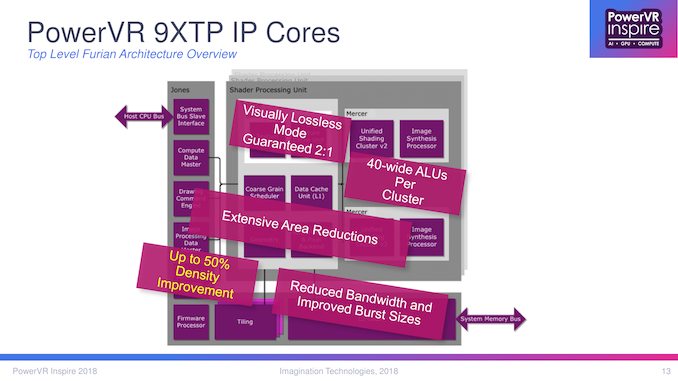 Elsewhere, the 9XMP also includes improvements to data paths in caching, atomic operations, Data Master setup rates, and compute overlap with other workloads. As for the Furian-based 9XTP, it features up to 40-wide ALUs per cluster, improved burst sizes, speedups for 3-planar and 2-planar (semi-planar) YUV, SPU scaling improvements, and general area reductions. 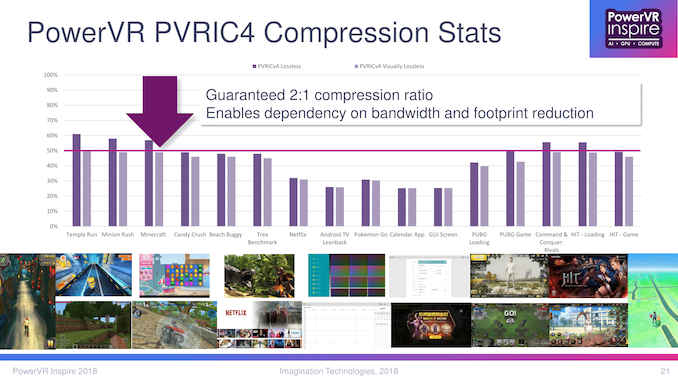 A large portion of enhancements come from bandwidth improvements and subsequent overhead reductions, a result of the latest iteration of Imagination’s framebuffer image compression technology, PVRIC4, which launched at the end of October. The 9XEP, 9XMP, and 9XTP all implement PVRIC4, and in short it enables a minimum of 2:1 image compression. With separate pipelines for lossy and lossless compression, the silicon decision logic opts for the lossless block if the level of compression is at least 50% or above. Below 50% and the lossy compression is used. The functionality is controlled and performed in hardware, and otherwise the lossy mode can be disabled via software controls; for certain compliance checks (such as those found in automotive) that lossy mode will need to be disabled. For a given image, then, various blocks may be compressed via lossless or lossy compression, the latter of which Imagination is claiming as visually lossless. Ultimately, we won’t be seeing products powered by these cores for another year or two, but the new full lineup belies the situation of PowerVR GPUs. While Rogue-based IP cores are both tried-and-true as well as more cost-effective and higher volume, Furian was designed with scalability, smaller process nodes, and neural networking in mind, so there’s only so far Rogue can take Imagination into AI and ADAS. 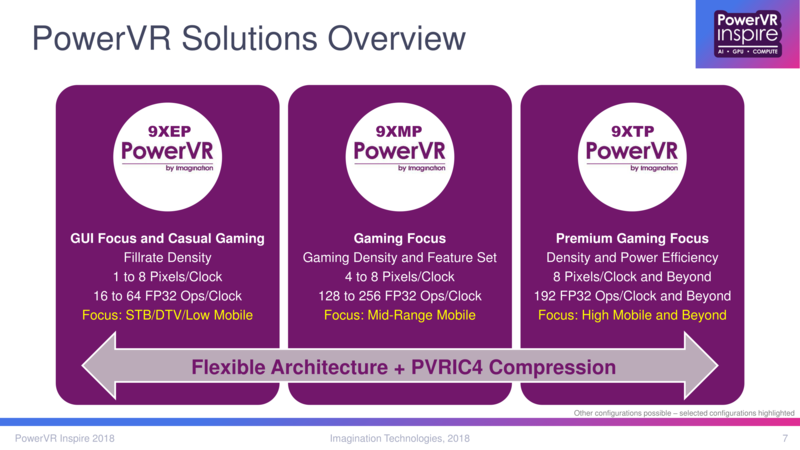 With Furian, given that the PowerVR 8XT GT8525 was launched over a year and a half ago, if Imagination has any design wins then we should start seeing products based on that shortly. But with Apple and eventually Samsung going the way of in-house GPUs, and Qualcomm dominant elsewhere, the premium handset GPU space isn’t getting any easier to break back into. So in that sense, automotive is natural pivot with Furian – and we’ve seen it already with the 8XT-A – offering a higher-margin and less established market on generally GPU-friendly compute tasks. And underlying this all is Imagination’s AI/NN aspirations and recent 3NX launch, which can lend another opportunity for Furian to find a foothold. The Series9XEP, 9XMP, and 9XT cores are available for licensing and are launching in roughly 2 weeks. You rarely hear which chip went in which car since the automotive suppliers (that make the Electronic Control Units for the OEMs like Ford, etc.) don't generally disclose that to the public.